My Arranger and I enjoyed a glass of wine and then dinner on our screened-in porch last evening. It was cooler, and the sky was overcast so we did not have to contend with the late afternoon sun. We were both struck by the marvelous fragrance that was filling our porch. 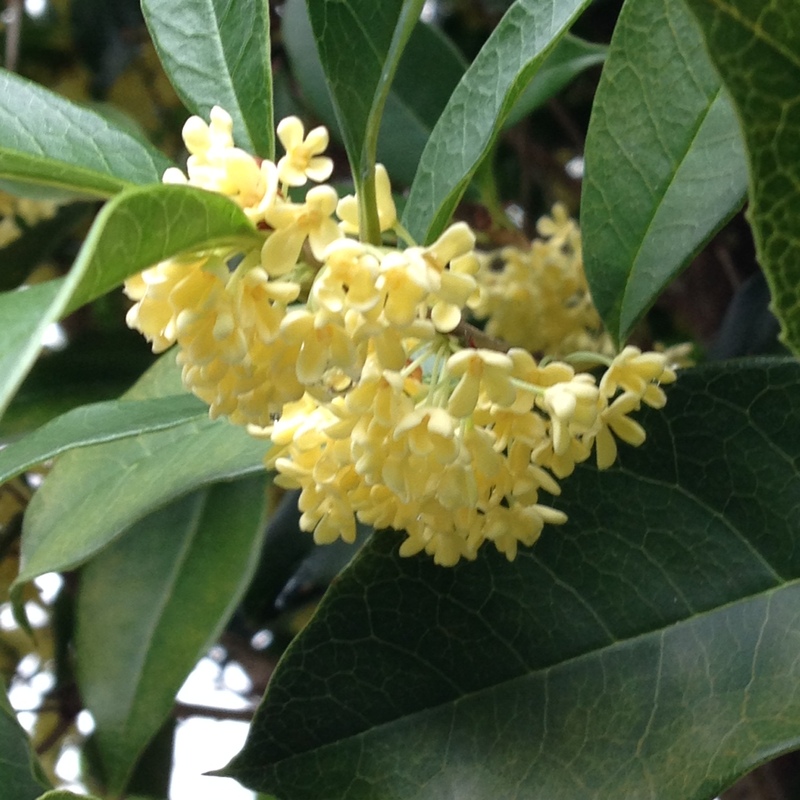 The tea olives (Osmanthus fragrans) are in bloom. There are two of them in my garden, one on each side of the porch, and in eight years they have reached well over ten feet. Actually I have top pruned them at that height for several years to keep them from dropping leaves and such into the gutters. 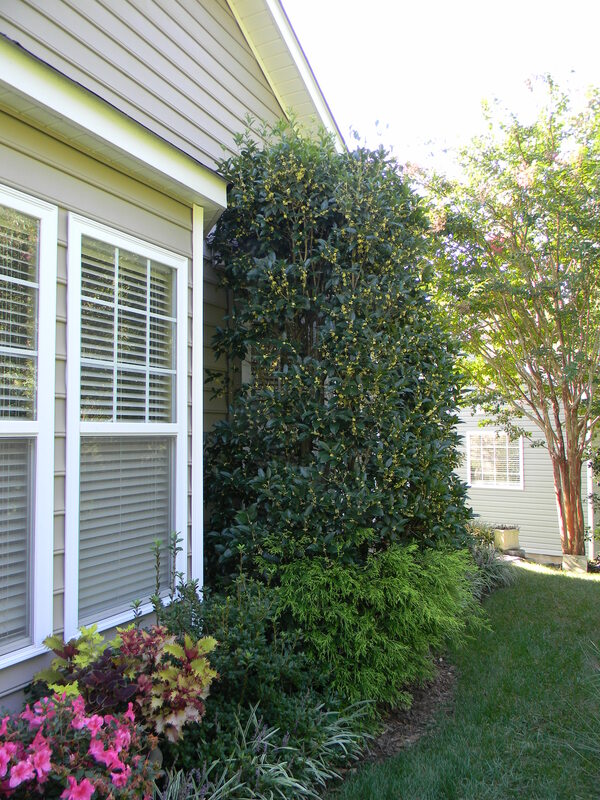 Tea olives are evergreen shrubs and make a wonderful year round addition to the garden. I have always contended that the flowers are inconspicuous, only alert to their presence by the fragrance they emit. This year, however, they are overflowing with blossoms, more than ever in this or our Chapel Hill garden. The flowers this year are particularly attractive, but the joy of tea olive is still the fragrance that wafts across our porch. It certainly added a touch of romantic magic to our evening. 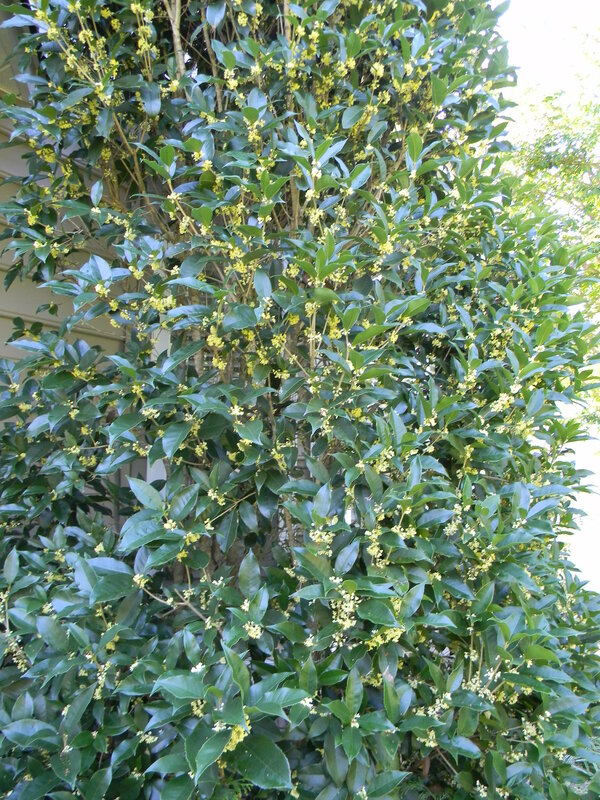 This entry was posted in Gardening and tagged frangrance, Guess What's in My Garden!, Osmanthus fragrans, tea olive. Bookmark the permalink. 6 Responses to Fragrance! Fragrance! Fragrance! Fragrance is always a nice benefit of any plant. Thanks, Susie. With the tea olives and the gardenias, it is a fragrant time of year. Scent is one of my favorite parts of gardening. The sense most strongly tied to memory, a familiar smell can take us back to another time and place easier than sound, sight, touch or taste. My mountain grandmother used to tell me how they grew mint near their front door and it would be their job to go “beat the mint” with a broom before company came. The bruised mint would provide a lovely scent for the visitor as they strolled up the front walk. The tea olives sound great! Cheers! Thanks, Benjamin. My grandmother also had a mint patch, but it was at the back steps. I dug some and planted it in my previous garden. Wow! Was it ever invasive. So now I restrict mint to a large pot. I still love it. Thanks, Mom. I hope you can find one…or two.